Estou aqui indecisa entre ir passear com o Fox na floresta ou fazer esta bomba de chocolate. A lei do menor esforço dir-me-ia agora que ir passear na floresta é o mais adequado, porque não dá trabalho nenhum nem agora a fazer nem depois, quando se tratar de derreter as calorias que acumulei por causa da escolha que fiz. Mas se havia algo em que os meus pais insistiram na educação que me deram foi a recusa da lei do menor esforço. De modo que vou ter de fazer o bolo: o caminho para o êxito exige espírito de sacrifício. Give the batter a few stirs with a rubber spatula, just to make sure that nothing has been left unmixed at the bottom of the bowl, and scrape the batter into the springform pan. The batter should fill only half of the pan. Put the roasting pan in the oven and pour the rest of the boiling water into the roaster to come halfway up the sides of the springform pan. Bake the cheesecake for 1 hour and 15-30 minutes, at which point the top will be browned (and perhaps cracked) and may have risen just a little above the rim of the pan. Turn off the oven’s heat, and prop the oven door open with a wooden spoon. Allow the cheesecake to luxuriate in its water bath for another hour. Cover the mousse cheesecake with foil, being careful to not let it touch the mousse. (If your springform is too small for this, just use less mousse in the cheesecake and instead eat them in ramekins while you prepare the ganache!) If making the ganacheimmediately, place mousse-covered cheesecake in the freezer as you make the ganache (the cheesecake should NOT be in the freezer for more than 30 minutes). Ifmaking the ganache later, place the cheesecake in the refrigerator for a few hours. 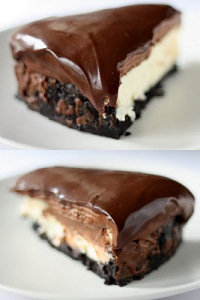 Either way, the ganache must be cool before you can pour it on top of the cheesecake. Release the springform pan. With an offset spatula, smooth the ganache while starting at the center of the cake and working outward. (I did a “crumb” crust by placing a thin layer of the warm, not hot, ganache on top, allowed it to cool in the freezer for 30 minutes, then I poured more on the cheesecake after releasing the springfrom pan so that it could pour down the cake.) Don’t do exactly what I did, though. Just pour ganache on top once it has cooled. Keep in mind that the cold temperature of the cake will cause the ganache to firm up quickly, and you may have to pour more on top. Save the rest of the ganache for decorations (if you whip the ganache when it’s cold, you can pipe a beautiful decoration) or save it for something else.